Hello Poets! I am Jilly, your host for this unique edition of Meeting The Bar in which I am offering support for our month-long Sonnet Challenge! The use of punctuation in poetry, especially when it is read aloud, is just as essential as it is in prose, but many of us find it difficult to read a poem to the punctuation as opposed to the line breaks, but that is just what we are meant to do. Part of what trips us up in the reading of poetry is the capitalization that occurs at the start of every line, even though the punctuation doesn’t fall into agreement. That is the nature of poetry and for some writers, the nature of working in Google Docs or some other word processing format that automatically capitalizes the first word of a new line. Our job, then, as readers, is to ignore those pesky capital letters when there is no punctuation. Our job is to read to the syntax road-markers, and so keep the meaning of the sentence or thought presented. An enjambed line is one in which the sentence does not stop at the end of the line; it runs through the line. Why do poets use this technique and how do we handle it as readers of poetry? One of the reasons poets choose to use an enjambed line is that it gives us multiple ways to look at a single thought in the poem. Our eyes, as readers, naturally take a slight pause at the end of a line – this makes that end-word so very, very crucial. The most important word in a line of poetry is the end word; the second most important word is the first word in the line. As writers of poetry this gives us a whole extra set of tools over writers of prose. We have the end word in a line, the first word in a line, and we have the role of punctuation as well. Many of you are participating in the month-long Sonnet challenge that Bjorn opened two weeks ago and more than a few poets have expressed a struggle with writing Sonnet form. Part of the difficulty comes in working with the meter and rhyme scheme. Well, my poetic friends, enjambment is a great way to break yourself and your reader free from the pattern that binds you. If every ten-syllable line of a sonnet completes a full thought before moving to the next line, it runs the risk of getting dull or sing-songy. Trust me; I’m an expert on this mistake in Sonnet writing!! In addition, the form can become the poem rather than the content. Have you ever gotten lost in a sonnet because the meter was just too, too good? I need a break from the jump-rope style of lines lest I fail to catch the deeper meaning of the words. Let’s take a look at Sonnet #129 by Shakespeare and see how the expert used enjambment to keep it fresh. Now look at the final couplet in the same way. The semi-colon in the first line is where the break in thought occurs and the rest of the couplet is the pithy proverb that sums up the point of the entire sonnet. One more little point worth making about the punctuation in this sonnet is that there are only two true end stops; at the end of line twelve and at the end of the poem. Curious and wonderful! What I most enjoy about this sonnet, and others like it, is that the sonnet form steps back into the shadows and the meaning of the poem takes center stage. This is achieved, in part, by the use of the enjambed line and the Bard’s placement of punctuation. 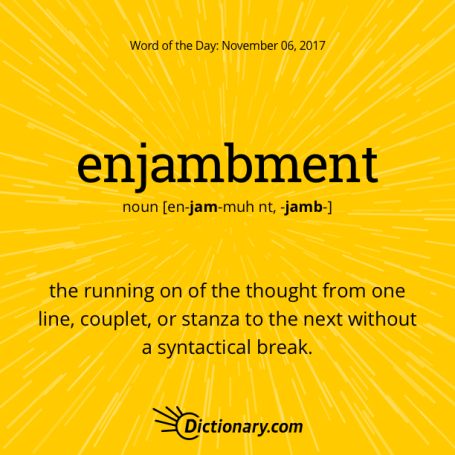 Whether in Sonnets or in Free-Verse poems, enjambment is a significant player in our poetry, so let’s dedicate this edition of Meeting the Bar to working with the enjambed line in the revision of our sonnets. This link to Bjorn’s Sonnet Challenge is open for two more weeks. This is a feedback and revision process! Please take the time to read what others have posted. We are encouraging each other in revision, so offer feedback when it is asked for. If you haven’t stopped by in awhile, you will be surprised at how many new and delightful sonnets have been posted. Be sure to read the later postings, too! Hello and welcome to this special edition of Meeting the Bar! I trust you are all having a great week. Thank you Jill for the informative post. I will try to visit, comment and revise in the coming days. Hi Jilly and All. Late again today. Just reading and very much appreciating the lesson. It is helpful to have the info and will try tweaking using enjambment if I succeed in the attempt. Glad you are here and look forward to reading your most excellent words! Good evening Jill! Good evening sonneteers! It will soon be goodnight here and it is so cold – we had snow today. I have linked up a revised version of a sonnet I wrote back in 2016, originally entitled ‘Shakespeare’s Hands’. I’ve changed the title, some of the punctuation and added enjambment. I forgot to change my name on Mister Linky to Kim M. Russell 3 as I had already linked up two sonnets when Bjorn opened up the challenge. I’ll have to pop back tomorrow to read and comment . See you all in the morning! Thank you, Jill – I’m wearing my warm cardigan this morning but forgot to put some warm socks on – chilly feet! So many links! Does this mean Mr. Linky is keeping an ongoing total of the links! We would like to give everyone a chance and time to participate in the project. For those who have linked up, this may mean revising our entries if needed, and commenting on other sonnets as well. Okay. I understand! Nope. I am good with the one modern sonnet I posted. wow. 66 entries so far! Jilly, I rewrote the first stanza of one but now see it doesn’t rhyme. Must it rhyme? Which one, Jade? I’ll stop by and read. Must it rhyme? If we are attempting to follow the strict rules of form, then it technically should. That said, many of the great poets have played fast and lose with those rules with amazing outcomes. Poets like Neruda went entirely into what is called free-verse sonnets. Blank Verse Sonnets are ones the have meter but intentionally do not rhyme. Are you, perhaps, blending traditional sonnet form with blank verse form? How innovative! I am editing it on my own computer on a word document. I can post the two here in this discussion, if you want me to? You can post them to the Linky and then work through the process. OK Jilly, I will finish the revision and then repost to linky. Bjorn, ok, “from internal rhymes to no rhymes” works for me. That does take the pressure off. Hello all, I love to use enjambment and has used it with the both the sonnets I have posted so far. I will come back and comment later, but it’s getting very very late. Thank you very much Jilly for being our host today. I appreciate the time you all put in to hosting and keeping dVerse online. I published my own poetry prompt sitr for a number of years, and realize how time consuming it is. I finally closed Writer’s Island down because it was just too much. You’ve thrown me a curve with the enjambment. I write short stories as well as poetry. Punctuation is essential in writing short stories, because it is a rectangular form. I am for more drawn to line breaks in poetry than to punctuation, preferring for my 55 years as a poet, not to punctuate or use capitalization in my poetry. This is why. Enjambment is a long standing technique in poetry, but it has always been very very uncomfortable for me, as I have a reading challenge that I have dealt with all my life, and with which I have learned to cope – but certainly not enjoy. When lines are close together, my eyes continually loose the visual connectivity between end of line above and beginning of the line below. It makes reading printed books of small font and close lines, such as most text books and novels, a very exhausting experience. I do it, but I hate it! Reading enjambed poetry ruins the poem for me, because flow and meaning, are easily lost. The Kindle, the Nook, the iPad were for me, a true miracle. I can enlarge the font, open the space between lines, and read 100mph – because the cognative ability to read words or groups of words, was never an issue. The ability to see sentence continuation in tightly packed writing is still incredibly frustrating. So I will never be a fan, whether reading or writing, of enjambment. All this said, I will make an effort to create an enjambed poet, and try to make it a sonnet if I can. Thanks for sharing your perspective. I try to remember that not every tool is for every writer; we play to our strengths. As I promised Jilly, I tried the enjambment technique. 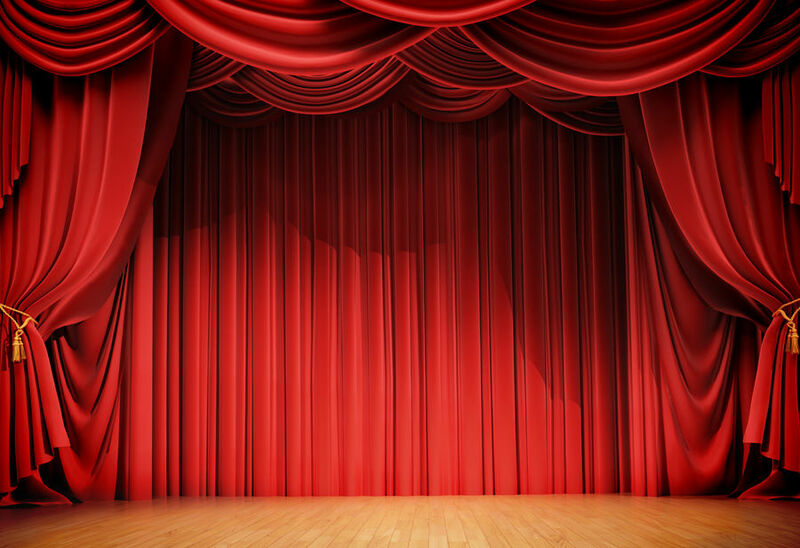 I just posted a second sonnet in which I attempted an enjambment in the 3rd verse. ?? I enjoyed reading your post because I wanted to hear the thoughts of someone who enjoys enjambment. I the last sonnet challenged, I greatly disliked the enjambments that several people employed, but probably that has nothing more but to do with the way I PERSONALLY enjoy poetry. And we all enjoy differently, of course. But I will try to express below three main reasons I dislike enjambment in sonnets. Maybe you already know these issues, but since I won’t be changing my poems, I thought I’d let you know why. I love free-verse as much as the rest. But I think forms are a very good intentional pause to do things that don’t come easy for us. You encouraged us to throw the discipline to the side if it frustrates you too much saying, “enjambment is a great way to break yourself and your reader free from the pattern that binds you.” It is all too easy to do this — to break forms. Sticking to the forms is something I wish we would try to hold ourselves. It is like telling people to keep their Quardrille to less that 100 words. I don’t want to stumble and stop and have to reread a poem many times to try to get some meaning because of brokenness in certain syntax. I love many different varieties in syntax and layout, but I don’t find it interesting to stumble through a poem. Some say we have to read many times to feel the poem, but I don’t enjoy that sort of poetry. You complained that often standard sonnets are “dull or sing-songy” but maybe that is just the sonnet’s writer and not the style. I won’t be going back to my 2 sonnets and doing these things to them. If you put up a different Mr. Linky I may have experimented there. But I loved reading your rationals if only again to see how different we can all be in our aesthetic preference. Thank you for your write-up. Hope that helped you understand folks like me. Thanks for letting me write. Jilly, thank you for hosting! Jill, and dVersers, I humbly admit that I live for enjambment, and submit that it takes a greater discipline to write a sonnet (or any form) well when you throw in that line/sentence curve; not to mention varying the punctuation. I realize it’s not for everyone. Some have been schooled and schooled well. Ah yes, ’twas Will himself who employed the technique, as shown above. Thanks for your kind comments! My pleasure, Jim! Actually, I always thought enjambment when my little toe finds the corner of the dresser at 4 a.m. in the dark. Usually doesn’t result in sonnet writing, just I, I, iambic darn-ameter!!!!! Hi Jilly 🙂 This is very informative and enlightening. Thanks for hosting and sharing your knowledge. I may have to write a third sonnet if only to embrace the enjambment! In the meantime, I will keep reading. Some wonderful work out on the poetry trail !! I revised my first sonnet for Jilly, and simply updated the revisions into my original instead of reposting it. Suggestions are welcome. Great! Will stop by and read! OK, I posted a new sonnet entitled “Shroomland”, in which I endeavored to do enjambment in the 3rd verse. I hope I succeeded? Thanks, Jilly. I think I got it this time. OOps, I got this wrong. Not the sonnet/combination enjambment so best ignored my post.